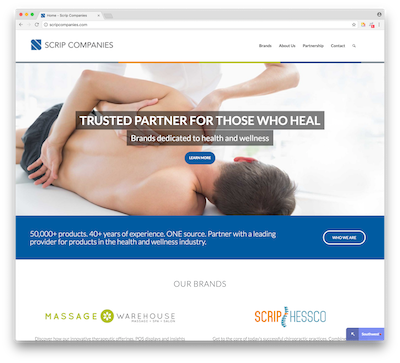 Scrip Companies have been providing millions of customers with the highest quality, most convenient online shopping experience for massage supplies, chiropractic supplies, spa supplies and home healthcare products for well over a decade. RWE has partnered with Scrip Companies to assist in all aspects of developing and maintaining their enterprise eCommerce platform - a series of web applictions and integration components handling product management, content management, eCommerce and integration with other systems. Interactive Clinical Systems' trailblazing enterprise web application Boomerang ™ provides a wide array of essential administrative services to health care facilities including resource scheduling, shift bidding, license credential archiving, agency management and much more. RWE has been the sole provider of all design, development and maintenance needs for ICS's Boomerang application since 2006, providing mission critical administrative support for thousands of doctors and nurses in dozens of hospitals across the country. FNF Construction is a major player in the Southwest's heavy highway construction market. Their highly visible projects include the Hoover Dam highway outside Las Vegas, the new Mill Avenue Bridge in Tempe and several major state highways in New Mexico, Arizona and California. RWE designed, developed, maintains and continues to evolve a corporate purchase card transaction reconciliation web application for FNF. This low-profile but very powerful application ties together credit card companies, merchant banks and proprietary accounting systems to greatly simplify and reduce the cost of the corporate credit card purchase/classification/reconciliation process for accounting and tax reporting purposes. Precision Components, Inc. is among the largest transloaders in the Southwest. PCI showcases our most extensive deployment of ReloadLogic ™, the enterprise inventory management system for rail transloaders. Since 1999, this system has tracked hundreds of thousands of rail cars, truck shipments and invoices involving millions of bulk material line items. 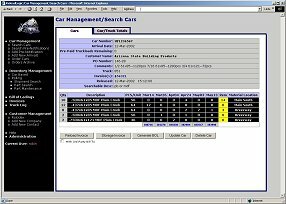 In addition to core inventory management components, the system provides several key advantages such as EDI and web services integration with Union Pacific for car movement, as well as novel components such as the ability to seamlessly archive digital photos of a flatbed load as it leaves the facility based on scanned barcoded Bill of Ladings generated by ReloadLogic. With tens of thousands of shoppers passing through the gates each weekend, ELGM's 35th Avenue facility is one of the hottest destinations in Arizona for swap meet enthusiasts. 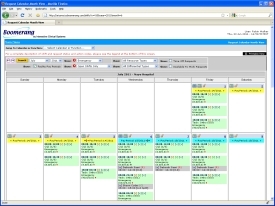 ELGM uses our web-based event management system - EventLogic ™ - to manage over 2,000 vendor spaces and peripheral functions. This implementation incorporates an interactive 2-D grounds map, point of sale interface, storage container rental management, space management, reporting and accounting integration into a single web-based application. GlobalWide Capital provides mortgage lending services to individuals nationwide. The "21 Options" and "Account Pipeline" applications developed by RWE allow GlobalWide to dramatically augment their sales and marketing efforts by giving their lending team and associate real estate agents access to vital account information in a marketing-friendly format without opening up sensitive internal accounts information. With these applications, GlobalWide has been able to provide real-time market and internal accounts information to its marketing efforts as part of a visually compelling sales tool. This project involved developing a Java Swing application to compliment ASSIST's web-based enterprise ERP system. 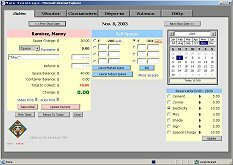 A client of ASSIST's - Harris Ranch Beef Company in Fresno, California - needed a desktop application to perform crucial functions when their local area network went down and the web-based system was not available. 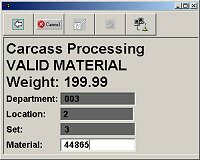 In order to keep the meat processing line moving without interruption, we developed a small GUI "Carcass Processing" application. It monitors network availability and gathers essential data inputs (from various human and automated sources) when the network is indeed down. This data is synchronized with the web-based ERP system when the network is restored. In addition to web-based applications with industrial-oriented functionality, RWE handles corporate website design and hosting. 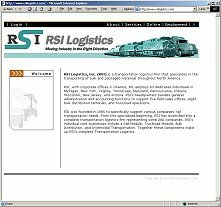 RSI Logistic's web presence with it's clear, concise layout and graphic design elements is a representative example of the kind of websites RWE has developed - often as a compliment to the deployment of a web-based application. 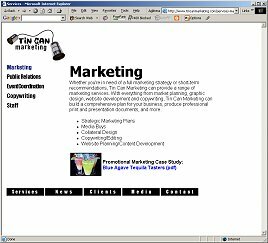 Tin Can Marketing is a public relations and marketing firm specializing in restaurant PR, sports marketing and educational trade shows. Tin Can needed a sharp, straightforward and visually appealing website to showcase their services and connect with existing clients. RWE provided the concept, design, layout and development of Tin Can's website and provides ongoing hosting & maintenence services. 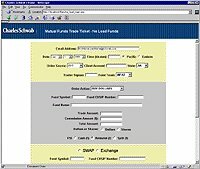 Management at Charles Schwab decided to automate a number of paper forms used to execute internal transactions. RWE designed and developed a web-based messaging system to place specialized internal securities trade requests and route them to the appropriate brokers. Six years after being deployed, the system is still used on a daily basis.